AUCTION DATE: TUESDAY, JANUARY 21, 2014 – STARTING @ 11:00 A.M.
FOR: COLIC TOOL & ENG. 2000 ACCUPRESS 10FT X 100 TON CNC PRESS BRAKE, ETS-3000 5 AXIS CONTROL, S/N 5918. 2000 ACCUSHEAR 10FT X .25’’ HYD POWER SHEAR, CNC BACK GAGE. 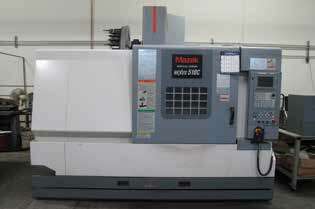 2002 MAZAK NEXUS 510-C CNC VMC, W/ MEZATROL FUSION 640M CONTROL, CT-40, 12,000 RPM, 40 X 20, 30ATC, S/N 161678. MAZAK QT-15 CNC LATHE, 8’’ CHUCK, MEZATROL T2 CONTROL, 8 POSITION, 5C COLLET NOSE, S/N 73203. HAAS VF-3 CNC VMC, CT-40, 20 ATC, 40 X 20, 7500 RPM, S/N 2072. 1991 HASS VF-1 CNC VMC, CT-40, 5000 RPM, 16 ATC, 16 X 10, S/N 1257. HAAS 8’’ 4TH AXIS ROTARY TABLE. TUDA 15 X 40 ENGINE LATHE WITH 9’’ CHUCK. CHEVALIER VERTICAL MILL WITH DRO, 10 X 50 TABLE. PARAGON 618, 6 X 18 SURFACE GRINDER. CINCINNATI TOOL AND CUTTER GRINDER. MILLER SYNCROWAVE 25O TIG WELDER. ATLAS WELDING POSITIONER MODEL 100. W.F. WELLS HORIZONTAL BAND SAW. RAMCO 16’’ VERTICAL BAND SAW. BALDOR DIAMOND GRINDER, GRINDERS, DRILL PRESSES. AIR COMPRESSOR 10HP 2 STAGE. LARGE SELECTION OF INSPECTION TOOLS, MICS, CALIPERS, GAGES, TOOLING, END MILLS, COLLETS, VISES, TOOL HOLDERS. LARGE SELECTION OF MATERIAL, AIRCRAFT ALUMINIUM.